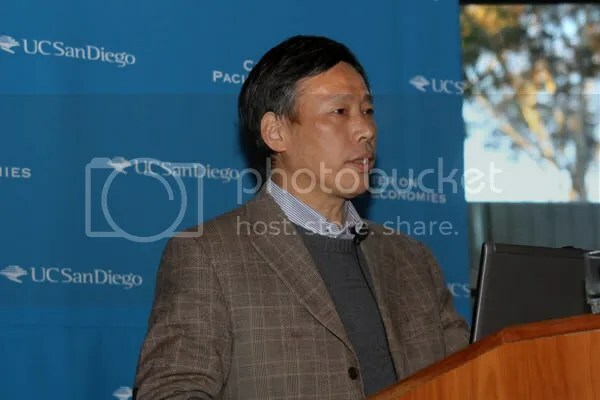 Xielin Liu, Associate Dean of the Graduate University Chinese Academy of Sciences, School of Management, arrived in San Diego in mid-November to present his research on technological innovation in present-day China. He remained in San Diego for three weeks, during which I was able to speak with him on China’s rapid economic development over the past three decades. PROSPECT: Where do you think China is headed in the next 20 years and what do you see in China’s economic future? LIU: I think in the next 10 years Chinese economic growth will not slow down. China will become more of a competitive power with the United States. Thirty years ago, you could not find any foreign brands in China. However, today you can find about every foreign brand in the world. China has more American cars than Korea. Even American agricultural products can be found in China. Although the country has yet to be open about everything (ie. Google), China has grown to be economically open. In a generation where wealth is the top priority, young people today are thinking about new ways to improve China’s economy. In Japan, an MBA degree is not popular, but in China, an MBA degree is becoming more and more prominent. However, even with all this in mind, China is still too dependent on countries like the United States. In the next 20 years, I see China developing their own technologies with their own institutions. Currently, many multinationals have monopolized China’s business. In order for China to grow, China is stepping on other countries’ toes. The American government seems to be angry at Chinese procurement. However, indigenous innovation is the only way for China to keep growing economically. PROSPECT: Do you think that China will eventually surpass the United States in terms of GDP? LIU: It will not be easy to surpass the power of the United States. China is a following country, not a leading country. Most of our technology comes from the United States, not homegrown. This is not to say that China has not developed. In China, we may use technology in a more efficient way. We have the human capital. In addition, China has rapid economic growth, so that creates an easy way to acquire the leading technology from the world. But we are still not as industrial or innovative as the United States. It takes time. PROSPECT: What role does the Chinese government play in economics? LIU:In the United States, the government has a limited role. The government of the United States is controlled by big businesses and so the government’s actual power is very limited. Usually what the U.S. government does is in the interest of a big business. In China it seems like the government is more powerful in terms of promoting a vision for business. It is the opposite of the United States. China’s government is powerful and yet they still help big and small businesses. For example, the government can provide industries with the high speed train or telecommunications. In the last 20 years, business has experienced a compounding amount of regulation. From what I have observed, the government has been playing very aggressively and doing good things at the same time. PROSPECT: You wrote a paper called “Innovation Diffusion: Mobile Telephony Adoption in China. How does the cell phone play a role in creating China’s vision?” What does more people having cell phones mean? LIU: In the United States, one would say that leading innovation really works. In China, you would say that a cost difference vision is important. The introduction of the mobile phone, for example, demonstrates the cost difference vision. In China, the diffusion of technology is costly. It is much more efficient to have prepaid cell phones or even prepaid cars. The paper shows that in a developing country leading innovative technology is not necessarily a good thing. In China, high prices with good technology does not work, but good technology with low prices provide the people with less costs allowing them to spend money on other goods. China is different. This is a reason why I think that multinationals will work well in the United States but not in China—because there is different model of vision. PROSPECT: Social development—does low technology increase social development as well as economic development? LIU: When the government is highly involved in the country’s activities, there will be corruption. This corruption causes social problems. There is no doubt that the government has been focusing on issues like high-speed trains while ignoring other problems like how clean the streets are. However, the government is also guaranteeing the increase in economic growth. And with economic growth, social development arises. Social development is most in need in the rural areas of China. By focusing on technology with economic growth, social development is slowly coming along also. For example, communication is good for the poor. Lower or middle-gauged technology can also be good for social development. Products such as computers and the Internet are targeted at rural areas and can improve social development. PROSPECT: Would you say China is still a developing country, or has it become developed in the past 30 years? LIU: China is so large, it is not easy to say. You cannot give just one image of China and say China is so poor or so developed. It depends on which part of China you are talking about. If you are talking about Beijing, Shanghai, Suzhou, the buildings are wonderful and you would say it is a developed country. But you know that in western Asia, it is not developed. China has multiple layers and in total skill it is very large. Nationally, inside there is a diversity of developmental stages. Overall, we are in transition. Also development means what kind of development? In coastal areas, we have high living standards and per capita income, along with science and technology. PROSPECT: What is China doing in terms of environmental laws? LIU: This is a concern for people in the United States, and also a concern for people in China. We know that China has a fast economic growth and high pollution. The government is aiming for more clean energies. The Chinese government has shown more concern for clean energy. We know that China will need more energy, but we need clean energy otherwise we will be in danger in the future. Pollution has become very tough issue in China. Coal is the main energy resource in China and coal is a very dirty energy. The whole country is saying that we need energy. The Chinese government has not spent a huge amount of money on clean energy. We cannot say that in the next 5 years we will experience an extreme drop in pollution in China but maybe in the next 10 years. Energy is the bottleneck of Chinese economics, so in some ways we have more pressure to find new energy sectors. For example in the United States, we have a lot of energy resources so we didn’t think about it for a long time. But in Japan, with little resources, they needed to find new resources. I do think, however, that the government is spending more money finding nuclear power and solar energy. PROSPECT: What about the aging population in China and Chinese-Americans immigrating to China? LIU: China is a country that values talent. We give the talented guy more opportunity for success. That’s why more American Chinese come back to China. In China, we have a shortage of talented people so we give more space for people to come back. For example, some of the Chinese in the United States, they have a seating where they cannot be promoted anymore—however, in China there is no such seating. You can apply at any level of the job. In the U.S., you have minority priorities, but in China you don’t have that. In addition, China’s economic growth is growing and then, hopefully, the social positions of people will increase as well. As for the aging population, the Chinese government doesn’t see it as a problem. But you know that maybe gradually there will be more problems. PROSPECT: In Chinese culture, Confucianism has always played a huge part in society. What are the effects of culture in the economy? LIU: Certainly, as a young child in China, you watch many Chinese dramas set in ancient China. Confucius has blood in the Chinese family. After economic growth, the society will follow. In the past 10 to 20 years the middle class has grown, but there have been only very small changes in thought and political democracy. With the Chinese culture, these complications emerge. They still play a big role. PROSPECT: Do you feel like China needs democracy? LIU: It is not for me to say if China needs democracy, but it is a question for the top leaders to answer. I believe that democracy is good for public interest. For example, we need balance in what the government does and what the public does. Democracy can provide this balance and harmony between the people and the government. Without democracy it can be worse, such as during the Cultural Revolution, where it was a mess. PROSPECT: In 1911, China left the era of dynasties in pursuit of a new republic. In 1949, China left the new republic in pursuit of a communist regime. In 1979, China left part of the communist ideology in pursuit of market mechanisms. During which specific time period do you think China was revolutionized? LIU: In 1911, revolution meant that China was very open to Western civilization. We know that dynasty wasn’t the best political regime for society. We said that we needed Western science and technology. At that time, certainly there was a revolution. Another time was the time period of Deng Xiao Ping. This time defined as a socialist government that could use market mechanisms. This is why China now has the mentality of communism or socialism but economically we have capitalism. This was Deng Xiao Ping’s idea, so I believe that this is a revolution within itself. Deng Xiao Ping said that we can use capitalism as a mechanism, not an ideology. In the United States, we use capitalism as an ideology and a way of living, but in China we use it as a mechanism. PROSPECT: What interests you the most and what made you want to become a professor? LIU: For people of my age in China, we had a terrible time in the Cultural Revolution. Many students said that we had to do something to help the country become more powerful and really help the country to be politically stable and further social development. For my father’s age, political struggle was most important… for my age, social development is very important. Throughout the Cultural Revolution, many people suffered and were very poor. When I was a student at Peking University, we were thinking about market capitalism and how that could benefit us. We were thinking about how we could make China stronger and better for society. And this next generation, they will have different ideas about a better life. PROSPECT: Last thoughts? Why are you here? LIU: Sometimes we think about what is the best thing for my country, but also what is the best thing for the world. Later on, 10 years from now, I think about what kind of values China can contribute to the world. Working together with other nations. For myself as a Chinese professor, we need more interaction with American professors here. Academically, the professors here have more open opinions and I think Chinese can learn from each other and from younger students here. We can have interesting lessons from here and take them back to China. And I can do more research and go back to China. And we can meet more common value and interests. Great interview Delia, thanks so much! –	our balance of trade with ALL our trading partners will be worse than it would otherwise be. –	free trade agreements will work to our disadvantage and we should halt entering into new ones. China’s beggar-thy-neighbor strategy is not a competitive devaluation of its currency, which would only cheapen its exports and make exports into China more expensive, but an over-valuation of the currencies of one or more of its trading partners. This negatively affects all the trade of the pegged trading partner(s), not just trade with China. U.S. Dollar over-valuation was 8 times as damaging to the U.S. recovery as what the media refers to as “China keeping it currency undervalued”. An Inflation-Neutral Balanced Trade System (BTS), inspired by Warren Buffett’s 2003 Import Certificate Plan is introduced at the top of page 4 of the Pdf.